There is a real chill in the air here in Arizona, but I love this time of year. 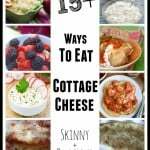 We tend to take advantage of the cooler temperatures and eat more warm soups and heartier dishes. 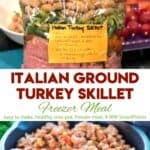 This Easy Healthy Italian Ground Turkey Freezer Meal is one of my favorites because it’s so versatile. You can use it in place of a pasta, add it to pasta sauce or simply serve it as a main with a side salad. And then you can turn any leftovers into a delicious Italian soup. 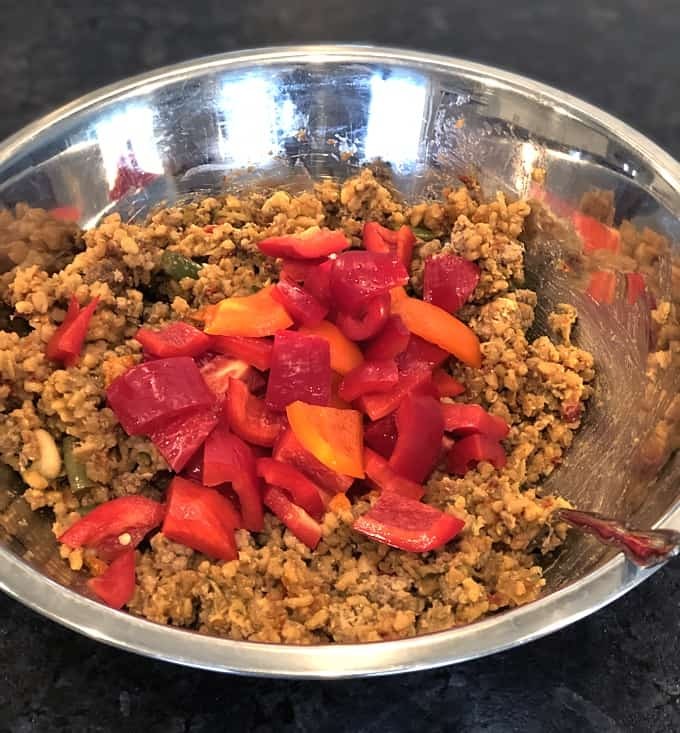 I often use anise-flavored fennel seeds when cooking with ground turkey. Not only do they give the meat a sausage like taste, but they’re also a great digestive and can help with things like heartburn and bloating. Cannellini beans are the largest of the white beans and are often called white kidney beans. They are a little meatier than Great Northern or Navy beans and are commonly used in Italian dishes. 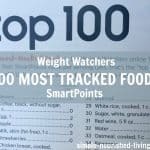 If you can’t find them, you can substitute with any white or kidney bean. 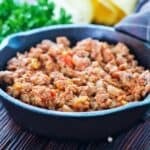 How Many Calories and WW Points in this Italian Ground Turkey Freezer Meal? 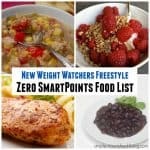 According to my calculations, each serving has just 225 calories, *6 Weight Watchers PointsPlus, *4 WW Freestyle SmartPoints. 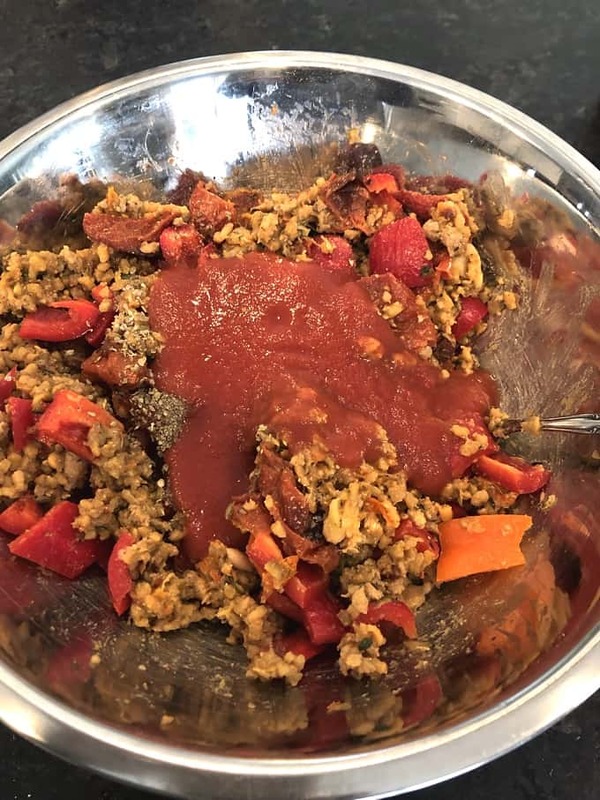 Gather 1 pound of ground turkey, salt and pepper, Italian seasoning, red pepper flakes and fennel seeds (if using). Wash and cut 1 cup cherry tomatoes in half. Shred 1 cup zucchini and squeeze out any excess water. wash and dice 1/2 cup green beans (if using). Drain and rinse 1 cup cannellini beans, pesto and tomato sauce. Label and date a Quart-size freezer bag using a magic marker, paper and tape or whatever you have available. Add ingredients to the bag in the order listed above, in Step 1. Step 3: Lay the bag flat in the freezer, at least until hardened. 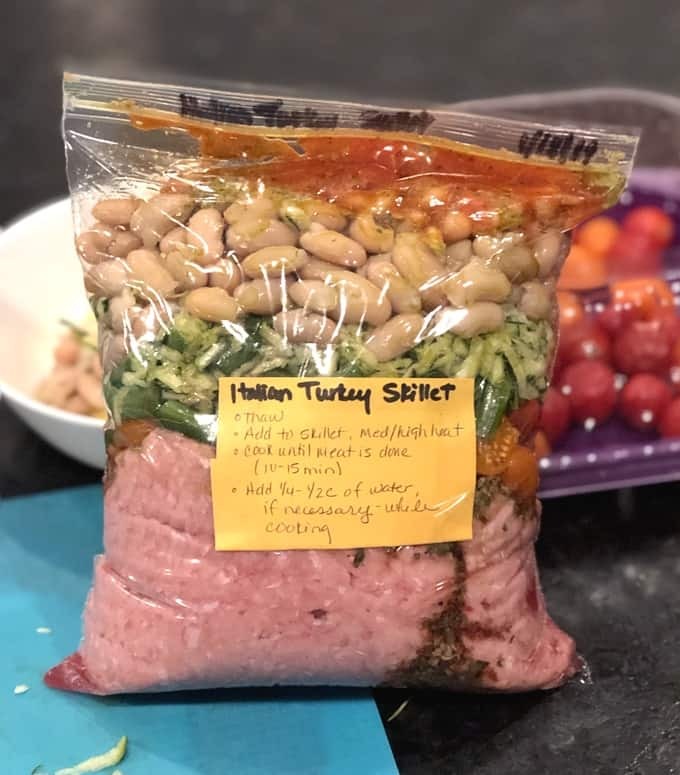 Plan ahead and place the freezer meal bag in the refrigerator for 24 hours prior to cooking to ensure it is completely thawed before cooking. Add the contents of the thawed bag to a skillet and cook over medium/high heat for 10 – 15 minutes, until meat is done and no longer pink. Serve with a simple mixed green salad with lite dressing. 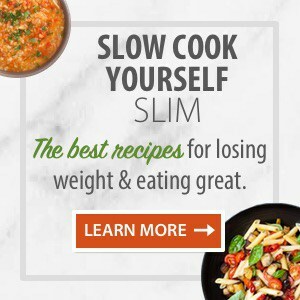 Serve over brown rice or angel hair pasta, or keep it low carb by serving over riced cauliflower or zucchini noodles. 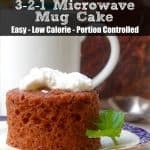 Use it as a filling in a pita or wrap. Make a soup by adding chicken broth, a can of diced tomato and frozen mixed vegetables. 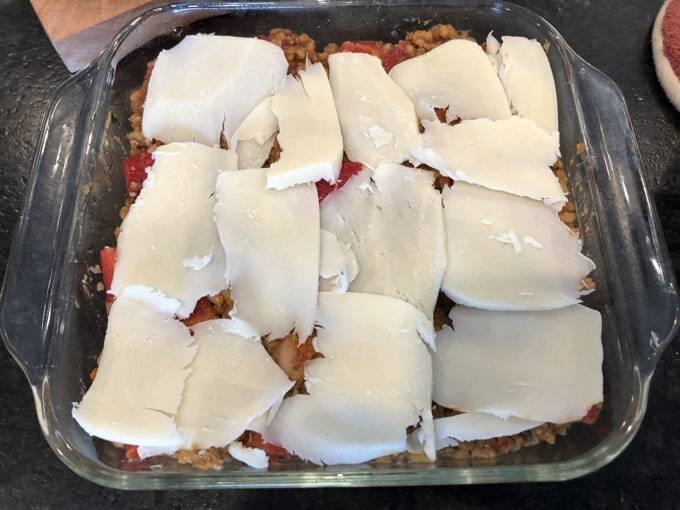 Add the mixture to a greased 8-inch square pan, top with shredded mozzarella cheese and bake at 350F degrees until warm and cheese is melted to your liking. Get creative with your leftovers. 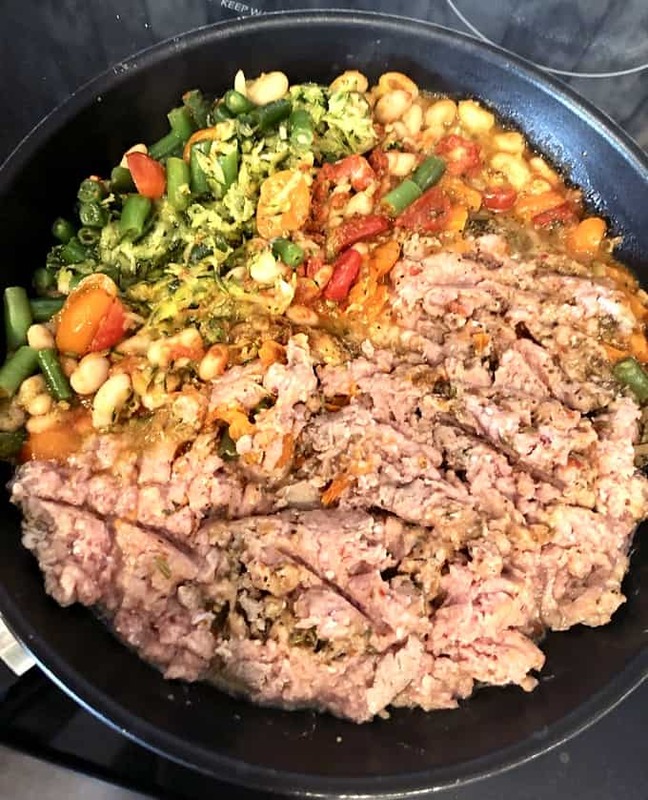 If my combination doesn’t sound good to you, try something else like adding more vegetables or using cauliflower vegetable rice. Do it your way and then share your recipe with us in the comments below. 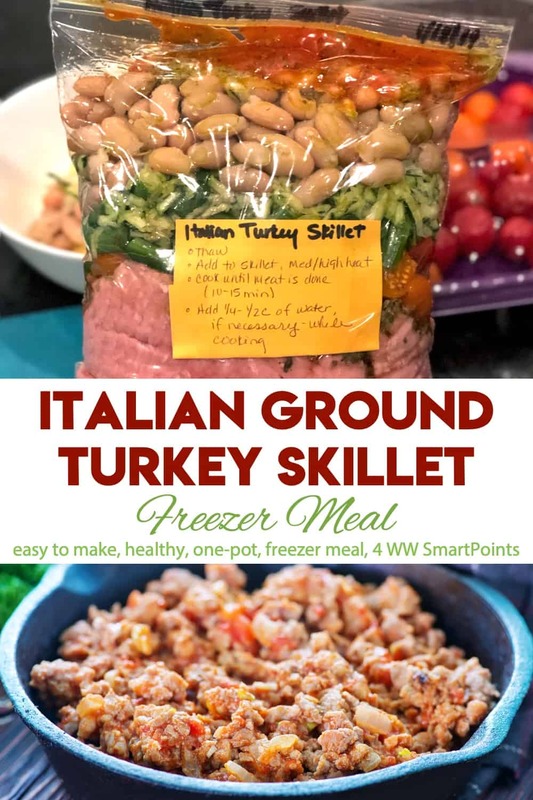 If you’ve made this One-Pot Italian Ground Turkey and Veggie Freezer Meal, please give the recipe a star rating below and leave a comment letting me know how you liked it. And stay in touch on Pinterest, Facebook, Instagram and Twitter for the latest updates. 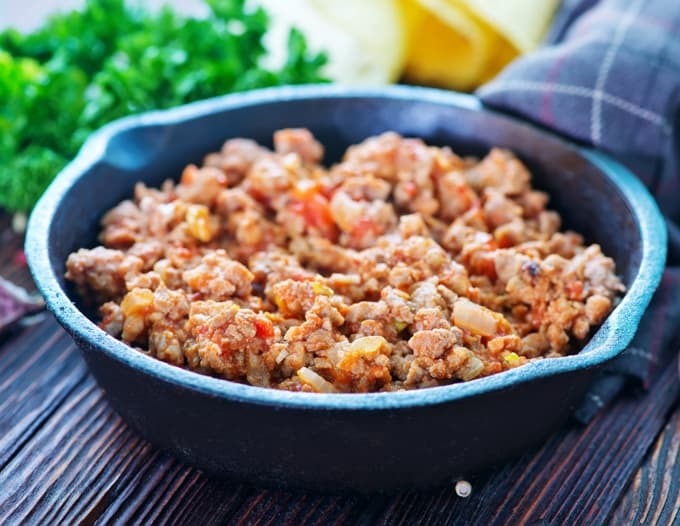 This ground turkey skillet is so quick to prepare, it's easier than getting takeout. 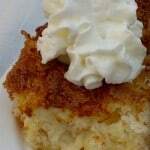 Plus you can vary the sides and have it your way! Label a quart size freezer bag using a marker, paper and tape or whatever you have available. First add turkey to the labeled freezer bag. 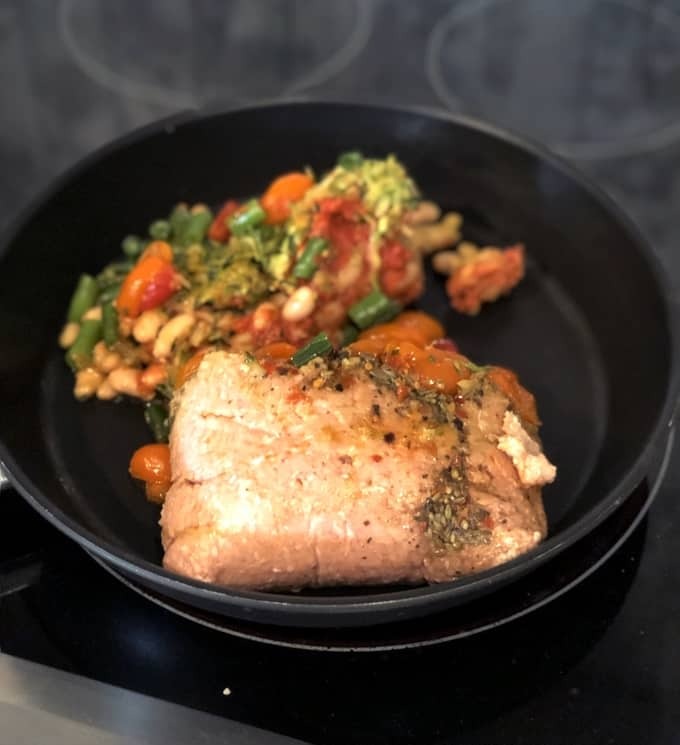 Add in the order listed above salt, pepper, Italian seasoning, pepper flakes, fennel, tomatoes, zucchini, green beans, cannellini beans, pesto and sauce. Remove as much air as possible and seal the bag (this helps prevent ice crystals from forming which results in freezer burn). Lay it flat in your freezer (at least until hardened). Remove bag from freezer and thaw in refrigerator for 24 hours prior to cooking. 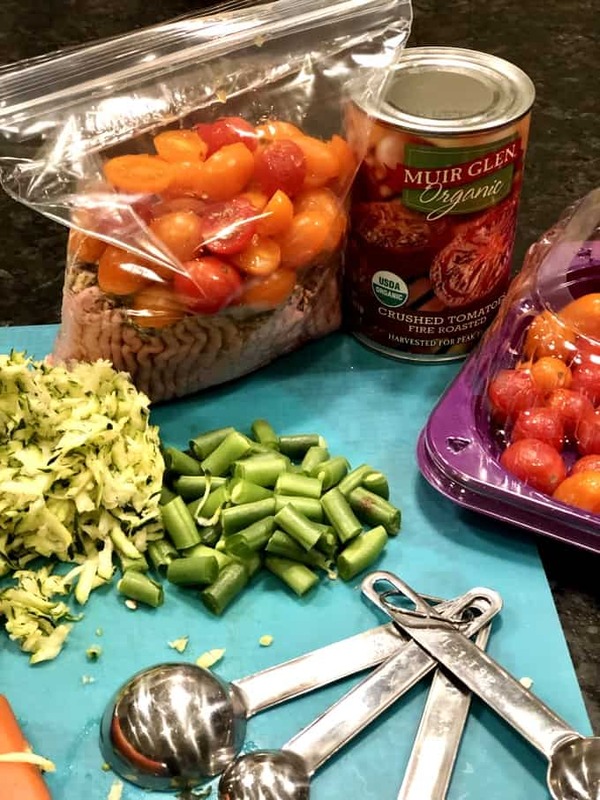 When you're ready to cook: Add contents of the bag to the skillet. Cook on medium/high heat for 10-15 minutes until meat is done. 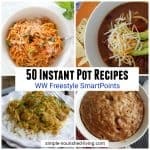 Add contents of the thawed bag to the slow cooker. Cover and cook on LOW 4 to 6 hours, or until done. Substitute one can diced tomatoes, well drained for fresh cherry tomatoes. 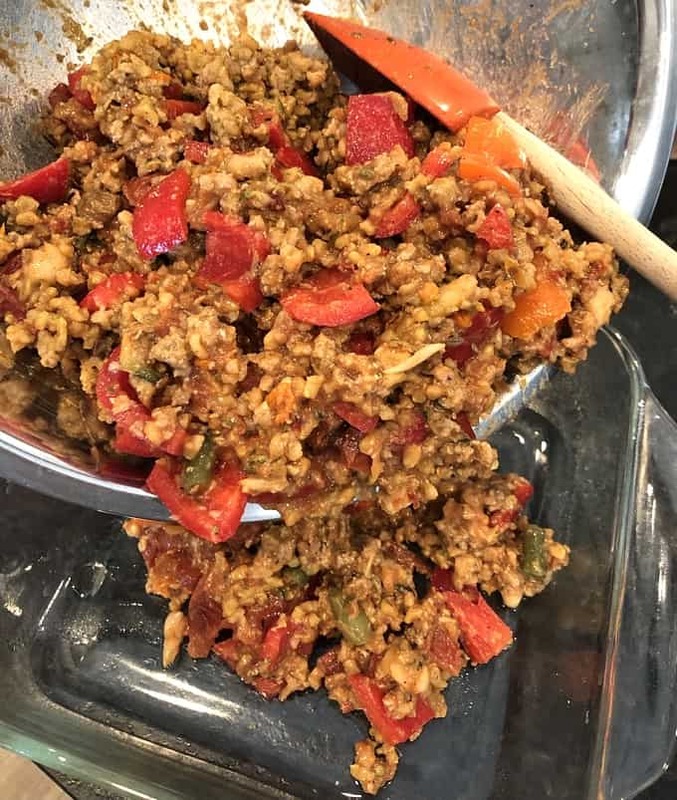 Adding fennel seeds will give the ground turkey more of a sausage taste. Substitute any white or kidney beans for the cannellini beans. 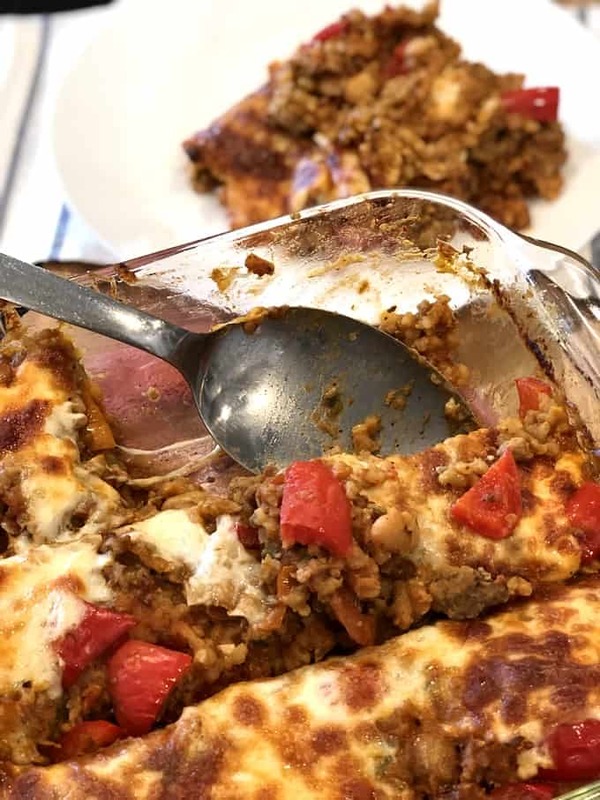 Recipe source: The inspiration for this family freezer meal came from reading the Family Freezer Blog created by Kelly McNelis.